As promised at the start of the year, I have a upgrade available for my Boomerang List Builder software. All of these features were requested by you, the software user. I’ve created a video showing you the 3 new features. You can view it below. The upgrade is free to existing customers. New customers will also be pleased to hear that there is NO price increase for this update, so you can still get your hands on the software for only $47! Click here to check out the Boomerang List Builder. No time for the video? Yesterday I wasted £30 – around $60 for my readers across ‘t pond. As you know, I run D9 Hosting with my business partner. The way we handle phones calls is to use an 0845 local rate number, and then the message is delivered to us via email, we then listen to the message and call back the caller using our own D9 Hosting skype account. Yesterday morning we got a call, so I proceeded to call the client. To my horror there was no sound coming from my headset, so the caller could hear me, but I couldn’t hear them, so I had no option but to hang up! I tried messing around with all of my volume and sound card settings but no matter what I tried I couldn’t get any volume through the headset. So I headed off to Amazon and purchased a brand new headset for £30. A couple of hours later I was about to throw out the old headphones, but as an after thought I decided to plug them into the lap-top just to double check they were broken. To my surprise they worked perfectly!! So back to the main computer I went, but this time instead of plugging in the headphones via the USB adapter I used the jacks (is that the correct term?) and they worked – turns out it was a Windows update that did something that the USB adapter didn’t like. So I’ve now got a new headset on the way, even though my old one’s work fine now. I Just Found A Niche! Welcome to this weeks newsletter, this week I was supposed to follow on from last weeks controversial “nofollow” post and I was going to show you how to remvoe the “nofollow” links from your blogs. However I found out that you can get all the info you need on that subject from the WordPress codex site (click here) so today I’m switching to something totally different. The story begins with an email I received after I posted last weeks blog article about the nofollow links I mentioned earlier. A subscriber of mine replied to my email and asked if I’d like to work with him on a project. You can see the email below. Sorry for the size of the above pic but I’m restricted a bit with the blog theme! In short, he asked me to take a look at a new product he had created and if I could give him some advice on how to market it. Aaron sells a number of his own Tattoo based products including various tattoo art designs and eBooks. The product he pitched to me was a new “Ready To Go” Tattoo based website that acted as a promotional vehicle for his other Tattoo products. The idea is for you to put up the website, drive traffic to the site and you then make 75% commission from the sales of his main product – a large collection of Tattoo based artwork, designs and all round tattoo goodness! Now this in itself is nothing special, I’m sure you’ve all got the odd “Ready To Go” website either online or saved on your hard drive, so what makes this one so different? 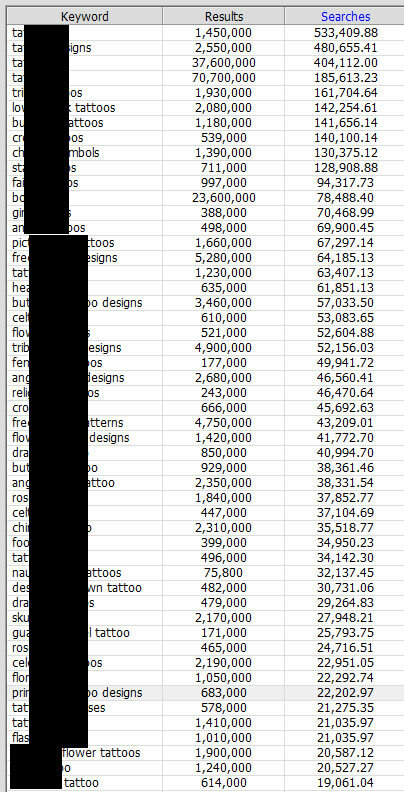 What you can see above is a brief overview of how profitable the Tattoo niche is, I used Keyword Elite to build a keyword list, then I ran it again to see how much competition there is for each keyword and how many results/searches there were for the keywords. Take a close look at the screenshot above, look at how many searches there are each month and then look at how little competition there is, it’s going to be a goldmine!! Why have I blacked out the actual keywords? Because in all honesty, I would rather keep them to myself as I plan on creating a number of niche websites based on Tattoos, and that keyword list shows me exactly which keywords to target. All I have to do is find a domain name that fits in with the keyword and then write a few articles and hey-presto, my site gets loads of traffic from Google. Don’t worry, there is a way you can get your hands on my Keyword List, but I’m not giving it away to just anyone, you’ve got to promise me that you are actually going to put your website online, and you are going to make a real attempt to make it work. If you just intend to upload your website and then forget about it, please slowly step away from the page, this isn’t for you! If you agree to the above terms, then you are ready for dominance in the Tattoo niche, here’s what to do next. It really is as easy as that! I’ve said this many times before, but it really is the best thing in the world when you manage to get on the first page of Google for a high traffic keyword! That’s what makes this niche so powerful, there are keywords and phrases that get thousands and thousands of searches each month, yet in a couple of cases there are less than 200,000 pages on Google for that search term. Any of you that have ever searched for a niche know how difficult it is to find a market like this, so are you going to sit back and think about what could have been, or are you going to be one of the few that takes action and sees results? I’ve given you everything you need to succeed in this niche – see the points a couple of paragraphs up. Please, please do use this information to your advantage, I can’t stress how powerful the Tattoo website and my keyword list is. In a way I’m stupid for giving it away but I made a promise to Aaron that I’d help him out and I do keep my word! Let me know if you have any questions or comments about anything! P.P.S. I’ve just noticed this blog is 2 years old, time flys! I wonder how many of you have been readers since the very first post back in 2006?